Would you Wear this to the Beach? All Dressed up and ready for today’s Board meetings. This Suit is a Wetsuit, it’s real, not a stunt. 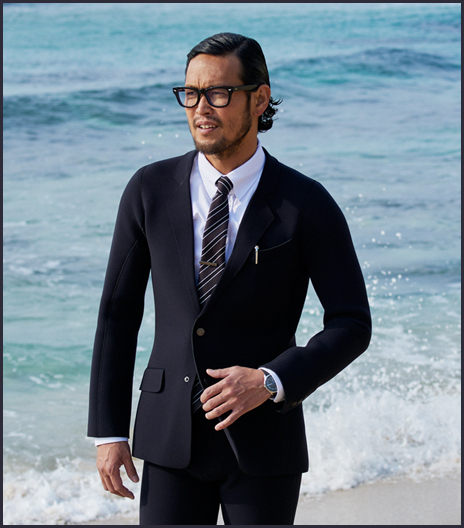 Quicksilver and Japanese Advertising agency TBWA/HAKUHODO have combined forces to create The True Wetsuit which looks just like a Business Suit. The jacket and pants are made from two-millimeter high-stretch neoprene, the shirt is created with a Quicksilver and 3M Dryflight fabric, and the whole set up also comes with a tie. Which of course, you don’t need to wear, I doubt the tie would even be safe out in the waves of Hawaii. We used to have some pretty fun Board meetings in Hawaii’s waves. Now, you can have the meeting and report to your office fully dressed ready to roll. Not too many people wear business suits to work in Hawaii, so I guess we should wait for the Neoprene dress slacks with the 3M Dryflight Aloha Shirt. Still pretty cool that these Wetsuits aren’t just a publicity stunt, but they actually are functional. Me, personally, I’m still trying to figure out where to put my car key when I go surfing. I didn’t see where the man in the video put his car key. But with most keys being electronic nowadays, I find it hard to take it surfing even with a triple sealed protective covering. Someone please help! See you on the Streetz and maybe out in the Surf!